So as I make slow progress in picking through and separating the pecans from the shells (a 10 pound box), I needed to break away before my fingers fell off…perhaps the biggest reason that I always buy shelled pecans, too much work and too-time consuming. I did come up with a bit of and improvised screening system, but still hands on is required. I love baby back ribs, tender, juicy, fall off the bone and above all slathered with a spicy BBQ sauce and Giada’s recipe for this spicy version meets every qualification especially on a day when there is no chance of grilling outside, yep, more rain. The ribs are nicely seasoned with brown sugar, salt, pepper, paprika and I chose to add pinches of smoked paprika before wrapping and oven roasting in foil packets. The Habanero might put too much heat into the final sauce so I switched it and added TJ”s Sriracha grilling BBQ sauce for just the right amount of heat without the burn. A real keeper recipe and I would rather use the grill for the final step. I imagine that one could successfully use “dried” plums or plum jam and I might give that a try next time since plums take forever to ripen unless they are soft and squishy when you pick them out. Preheat the oven to 300°F. 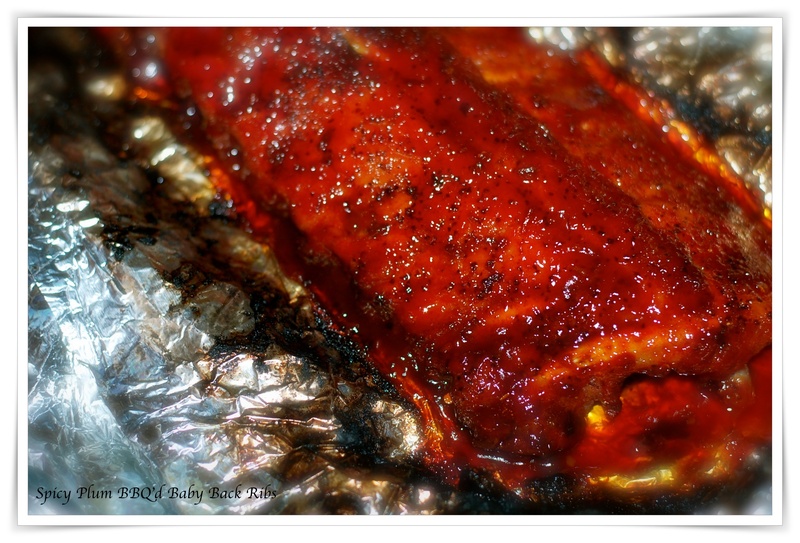 Wrap the ribs in two sheets of aluminum foil large enough to enclose them. Mix together the brown sugar, paprika, and salt and rub over both sides of the ribs. Place on a rimmed baking sheet and bake for about 3 hours, or until tender but not falling apart. Remove them from the oven and allow to cool slightly, about 30 minutes. To make the sauce while the ribs are cooking, heat a medium saucepan over medium heat. Add the oil, onion, garlic, and ginger to the pan and cook, stirring often with a wooden spoon, until the onions are soft and fragrant, about 4 minutes. Add the plums and allspice and stir to coat with the flavors. Add the vinegar, sugar, salt, and Habanero, and stir to combine. Simmer the sauce and reduce the heat to low to maintain a gentle simmer. Simmer for about 20 minutes or until the plums are very soft. Discard the Habanero. Using an immersion blender, puree the sauce until it is as smooth or as chunky as you like. Preheat a grill to medium, and brush the ribs all over with the BBQ sauce. Oil the grill and place the ribs on it meat-side down. Cook until lightly charred. Flip the ribs and grill on the other side. Brush both sides with more sauce and continue to cook until the sauce is thick, sticky, and golden brown. Serve with more sauce on the side if desired. The ribs can be broiled as well to finish.